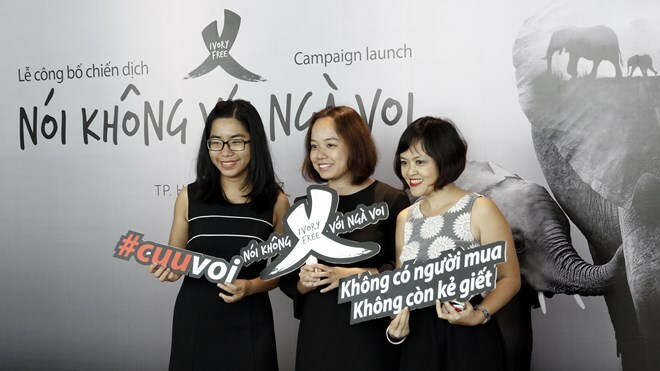 HCM City (VNA) – A “Say No to Ivory” campaign was launched in Ho Chi Minh City on August 30 with a view to raising public awareness of elephant protection. CHANGE Director Hoang Thi Minh Hong said her centre is carrying out communication activities to improve public awareness of elephant protection by not buying or using ivory products. The “Say No to Ivory” campaign is set to last for three years, she noted. John Baker, Managing Director of WildAid, said the poaching and trading of elephant ivory has been banned in many countries, but the elephant killing in Africa and ivory trading in Asia still occurs. WildAid has worked with China and Thailand to prevent illegal ivory trading. In Vietnam, it is focusing on measures to change people’s wrong belief in the uses of wildlife products, including ivory, through communication publications. Do Quang Tung, an official from the Ministry of Agriculture and Rural Development, said the number of elephants in Vietnam has fallen from more than 1,000 to about 100 which mainly live along the border with Laos and Cambodia. Vietnam has become an illegal point of transit for ivory over the last decade, he noted. Elephants are being strictly protected at national parks and ivory trading is completely prohibited in the country, Tung said, admitting that a large volume of ivory has still been illegally transported into Vietnam.